An ancient evil is unleashed in the modern world— unless one fearless P.I. can hunt it down. . . . Nikki Glass, Immortal Huntress, returns in this new novel in the acclaimed series by Jenna Black. As a living descendant of Artemis the Huntress, private investigator Nikki Glass knows how to track someone down. But when an Oracle shows up, warning the Descendants about wild dog attacks in Washington, D.C., Nikki is afraid it might be a trap. The Olympians believe the “dogs” are really jackals, controlled by a blood-crazed descendant of the Egyptian death-god Anubis. Whatever. . . . If Nikki hopes to muzzle Dogboy, she’s got to catch him in the act. But when she stakes out a local cemetery, she ends up face-to-snout with a snarling pack of shadow-jackals whose bite is worse than their bark. These hellhounds are deadly—even for an immortal like Nikki. “Dog” spelled backward may be “god,” but that won’t stop Nikki from teaching these old gods some new tricks. Like playing dead. Deadly Descendant takes on the same easy pace as its predecessor, Dark Descendant, but with more heat, action, and emotion! Jenna Black gives readers a greater look into some of Nikki's Liberi housemates, especially, Jamaal. Jamaal is a very out of control character and completely mysterious in the first book, so it's intriguing to see him slightly open up and drop his guard around Nikki. The assignment Nikki is handed in Deadly Descendant is creepy and just a little shy of downright scary! The crazy descendant of the death-god Anubis is on the hunt and armed with powers unfamiliar, and very harmful, to Nikki and some of the Liberi. The plot leads readers to believe that Nikki might not be able to succeed this time because there is more than one foe working against her. Anderson's traumatized wife is letting her claws show, but this unexpected twist is entertaining and adds to the overall build of suspension. The novel's conclusion is clever, leaving readers excited, awed, and aching for more action. 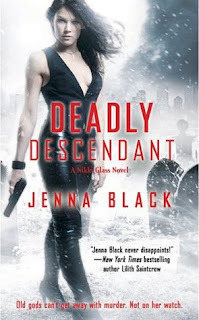 Black has written the perfect sequel to Dark Descendant and its only a matter of time before she impresses urban fantasy fans with the next Nikki Glass installment. Read my review of DARK DESCENDANT!